Travel piece for Time Out Magazine. Isolated and near inaccessible, Asia’s newest nation is home to the largest UN peacekeeping mission on Earth, located in the poorest and most overlooked corner of the region. 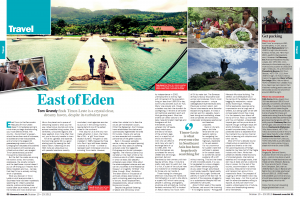 Emerging from decades of bloodshed and occupation with scarcely any infrastructure intact, war-ravaged Timor-Leste attracts just a few thousand tourists per year. Roads are amongst the world’s worst (where they exist), the airmail service is rumoured to take one-and-a-half years, the humidity is oppressive, healthcare minimal, poverty rampant and the dinky shot-up capital, Dili, makes Beirut look refined. So why would anyone care to visit? Because travellers will discover in Timor-Leste what everyone else in Southeast Asia is hopelessly searching for. All your dreamy paradise island clichés can be found within – pristine white beaches, crystal clear azure seas, some of the richest and most diverse sea life on the planet and a queue of welcoming, unjaded locals to show you the way. Adventurous tourists will come across incredible hiking routes, thick rainforest, untouched lagoons and delicious seafood – and more often than not, you’ll be the only traveller in town.